¿ JOIN ME FOR PIE AT BREAKFAST ? First, let me be clear. The banana is there simply to smile back at you – Good morning! Welcome to my table! – it is not part of the breakfast pie. I consume one each morning after having a refreshing cup of organic green tea, which I buy in loose 100-gram packets, directly from Japan, – eating the banana before making pie. (I’ve been eating this breakfast most mornings for several years, but have yet to tire of it; and I weigh about the same I did when I graduated from high school: 155 pounds, +/– 5 pounds, depending on season. Robert Frost popularized one definition of a Yankee as someone who eats pie for breakfast – but a famous-yet-mysterious person named Anon said it first. <grin> Real pie crust is made with lard (don’t hang up! ), and is best followed by vigorous outdoor labor, to keep it from adhering to wasteline or chin. But my recipe is considerably different, easier, and healthier. Up front I will assure you that this pie contains no additional sugar or fat, yet is deeply satisfying, even while having no crust. But can it be pie, without crust? you ask. Taste and see, I say. 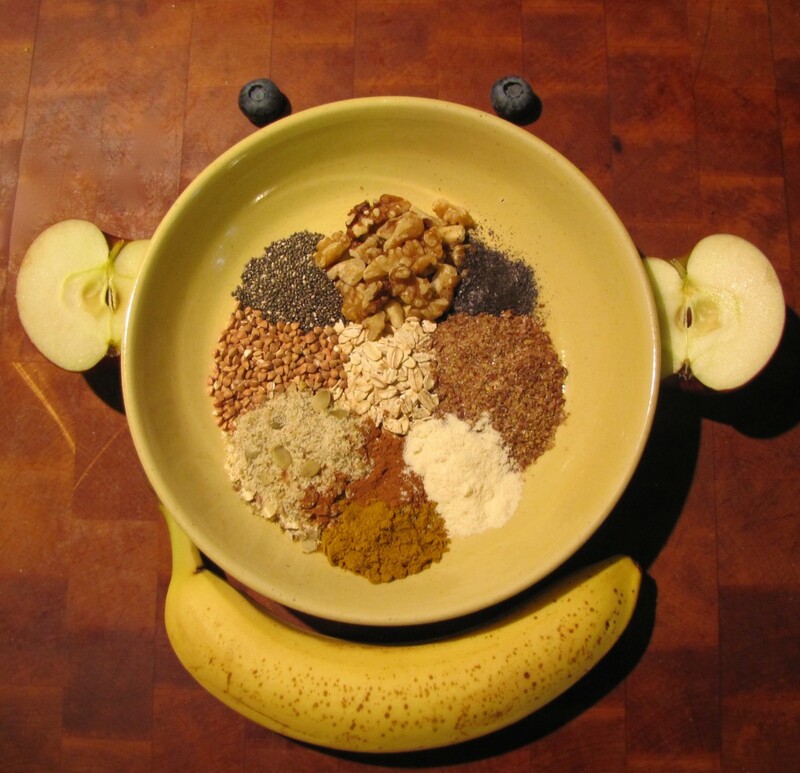 Let’s review the ingredients by imagining a clock face which is just a bit shy of numerals. Starting at 12:00, above, we have a small handful of walnuts. 3:00 is a tablespoon of freshly ground flaxseed meal. Fresh grinding is important, as flaxseeds have a tough shell which tend to pass thru without releasing their omega-3’s; and pre-ground flaxseed meal breaks down quickly, starting ~15 minutes after grinding. 8:00 is freshly ground organic pumpkin seeds, hulls removed by the supplier. These are a staple among Native Americans. We first ate them in Merida, and now also toast them for salads. In this dish I simply grind them raw, dried. Most health food stores carry them, as does the bulk department at our grocery up north, Wegmans. They can be found at the main market in Centro, Merida, and elsewhere, as semilla de calabasa, sin cascara [lit. seeds of squash, without hulls]. Beware. I’ve found small stones in the seeds from the main market, several times. Rock around the clock, in the words of that early rock’n’roll song. Just add some milk, a small apple, chunked but not peeled, and a few blueberries, frozen or fresh. We get them frozen at Costco in Merida, even organic. The fruit makes the dish sufficiently sweet for me. If sweeter is better, consider adding some prune juice to displace some of the milk. I don’t measure liquid for this dish – simply saturate, pop the dish into the microwave for precisely 4:44 which is the most efficient way to key-in ~5 minutes. When done, add a couple dollops of good unsweetened yogurt (1% low fat). 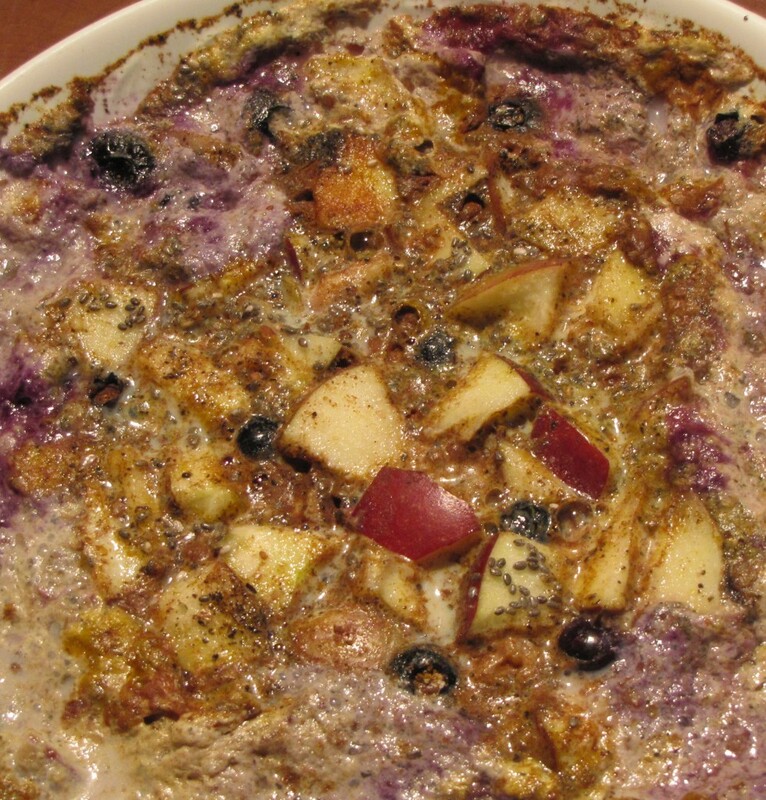 If using frozen fruit, add after cooking to speed cooling, blending fruit and yogurt into the mix. Being a Yankee has never been easier! And only one container needs washing. Here’s what it looks like. Wish I could serve some to you right now. Virtual pie will have to do. <smile> Upcoming: a low-tech way to make truly great espresso. Pie. It’s what’s for breakfast! The Mayans were seriously ahead of the Europeans for a great long while, as they knew how to count much more efficiently. And while their counting system might look daunting to modern eyes, being base twenty, it had only three symbols: zero, dot, line (line being a compiler representing five, like our four ones scored thru with a slash). No, it’s not Morse Code! The result of this simplicity was elegant, and it enabled them to devise a calendar which was exceedingly accurate. The concept of zero was a great advantage. 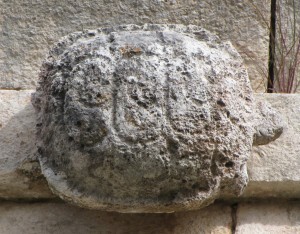 They represented zero by depicting a turtle on its back (dead?). For example: over the course of a million years, the Julian calendar had an error of 7802 days; the Sothis calendar 2198 days; the Gregorian calendar 302 days; but the Mayan calendar only 69 days. And the Mayans could have made their calendar even more accurate, with a residual error of only 2 days, but for their penchant for divisibility of numbers. 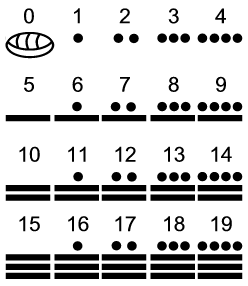 The astronomical correction cycle is 1507.03 years, but the Mayans instead of rounding down to 1507 (which would have given them the 2 day correction), they rounded up to 1508 for greater divisibility. 1507 has one division of 11 X 137, but 1508 can be divided by 4 and by 13 and 29, two very important numbers to the Maya. Friend Peter sent me a short video showing how the Maya did math. Pretty cool, no? 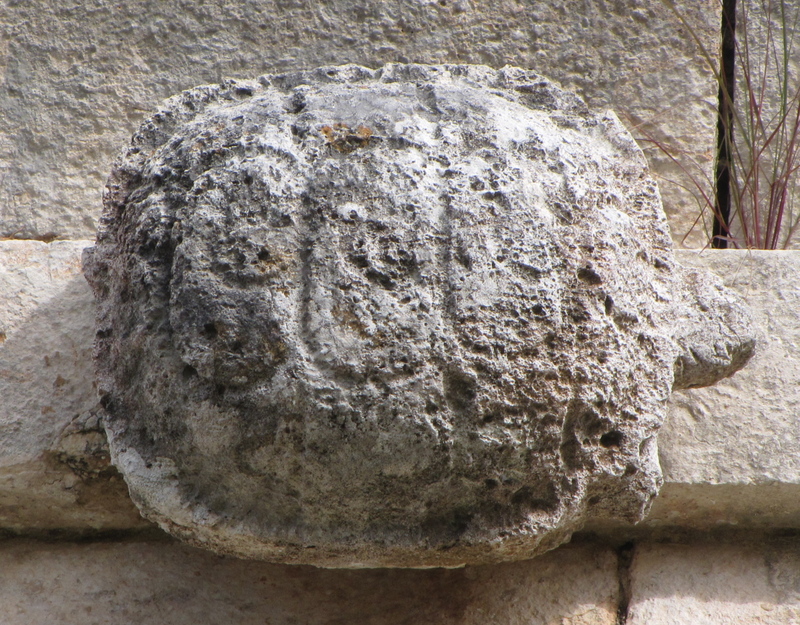 Turtle shell adorning a temple at Uxmal. Merida is a very friendly place. While most locals may be somewhat shy, they are warm and welcoming, as noticeable in the frequent smiles and greetings extended to visitors walking the sidewalks. This is rather refreshing to those who have ever lived in New England, for example, where people tend to avoid eye contact, pretending others scarcely exist, as a safeguard to personal privacy and security. Yes, Merida has its hawkers in the heart of downtown who will try to engage you in conversation to lure you into a nearby shop for a commission. But they’re mostly harmless, and the shops are easily overlooked, but fascinating. Yet the majority of those sidewalk smiles are genuine, without ulterior motive. 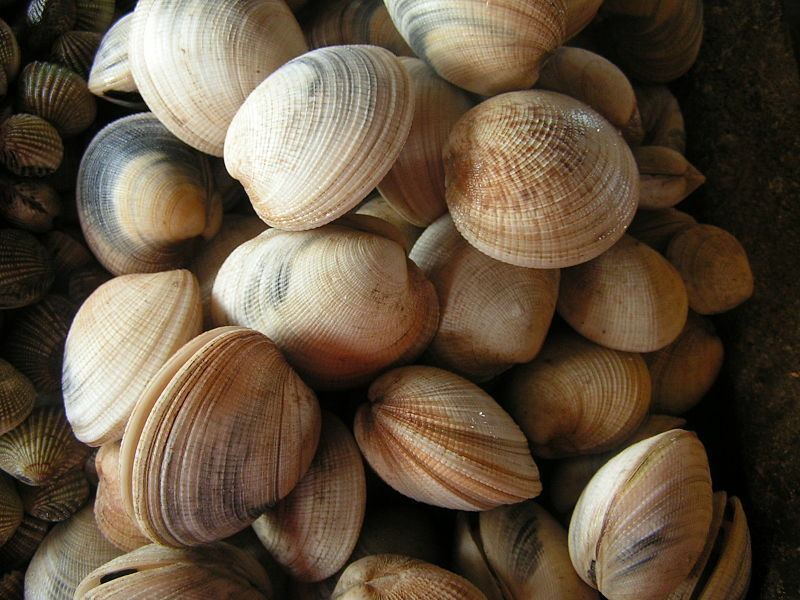 So, don’t clam up! 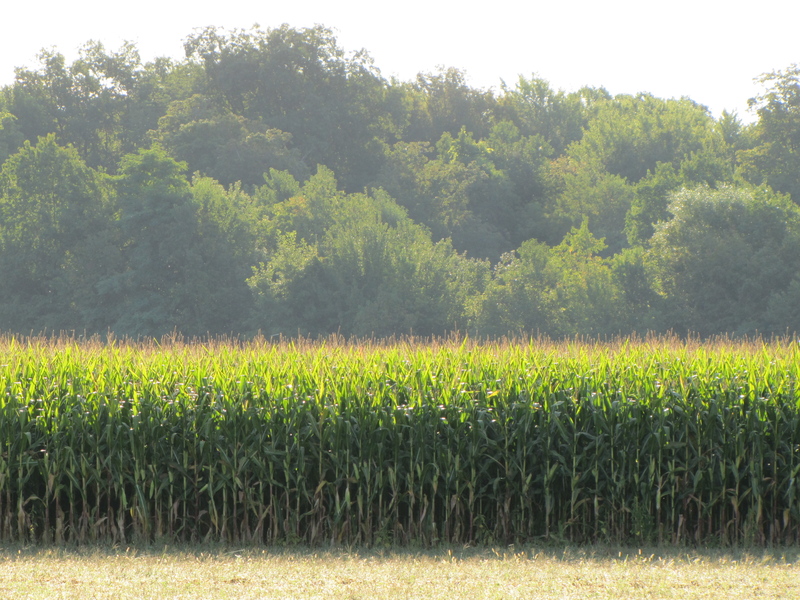 CORN: BIG questions on genetic engineering! Corn: when is it wholesome? Corn is a gift from the people of Mexico, where it was first noticed and selected, to the population of the entire world. Those early seed-selectors recognized the value of this seed-bearing grass, and helped select seed for its food value, turning it into a very productive and nutritious crop. The result has fed the world – but due to recent changes, corn might now be causing health problems, according to peer-reviewed research. Some corn has changed recently, selected for resistance to an herbicide. This GMO corn (genetically modified by Monsanto) is known to have some alarming side-effects. Europe won’t allow this kind of corn to be sold there. But US farmers are eager to export it to hungry nations. Ironically, this questionable crop is being sold to Mexicans, where it also undercuts the price which Mexican farmers get for their own corn. If GMO corn damages people and butterflies, while also putting Mexican farmers out of business, is it still a wholesome crop for people? When a change is made to an original design, whether thru modification, or thru natural selection, it’s important to learn if the change is for good, or for ill. Simply because a change is profitable for a rich company and for wealthy farmers doesn’t automatically indicate that the change is good – especially if the health effect on consumers is bad. If a tomato has a gene from a starfish, for better frost resistance, is it still a tomato? Perhaps. But a better question might be is it still wholesome? This is a right question to ask about GMO corn. It’s important to recognize that science has become a tool of politics as well as of truth. Questing for truth is best done without looking at costs and profits. Reality is the measure of all things, yet not easily discerned. Dollars are a poor yardstick. Is this new type of corn wholesome? Are these reports merely alarmist? Science alone, absent commercial influence, is equipped to resolve this. Politics is about benefits for interest groups, which are often selfish. The public should be allowed to vote with our wallets, once the science (which is never complete) is reasonably settled. GMO corn should be listed on ingredient notices so people can hold a fair election in a free market at the grocery store, by choosing to buy or not buy such products. Governments which will not allow such markings on food products, blending this very different corn into the bin with regular corn, are guilty of propping up toxic food policies for profit. Let consumers decide! Meanwhile, rich folks can buy organic corn, while poor folks are fed food fit only for lab rats (see link in comment section). But there are other grains, which will be a topic for another day. Their support is truly awesome. Recently our phone began to perform oddly. I had to call support several times, which I’d never done before. They refreshed the connection. After the third request in as many weeks they offered to send me a new power adapter for free! This company knows something about customer care! How to use it: buy the unit, shown in the photo, or a more recent iteration. Plug it into your computer for an initial handshake connection. Assign your number. Then remove the device from your computer, plugging it into any normal household circuit near your computer, modem, or wifi hub. Done. There’s a big change coming to the telephone market! This gizmo will pay for itself in three months, or less. NOTE: These devices are soon to be sold in Mexico. See the comment below. What’s in a name, Strawman? Identity theft is the latest con, or so it would seem. But it turns out that it’s been going on for a great long while, and the first offender is the state. The tale is quite alarming. It’s as if we’ve walked into a long-running movie (titled Life! ), and we’re questing (or not) to figure out what it’s all about. Just ask Alice. Lewis Carroll’s Alice was coming to realize that everything was ruled by nonsense, in the person of the Queen of Hearts. 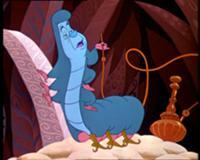 The Caterpillar had asked Alice that most pointed of questions: Whooo are YOU? Alice: This was not an encouraging opening for a conversation. 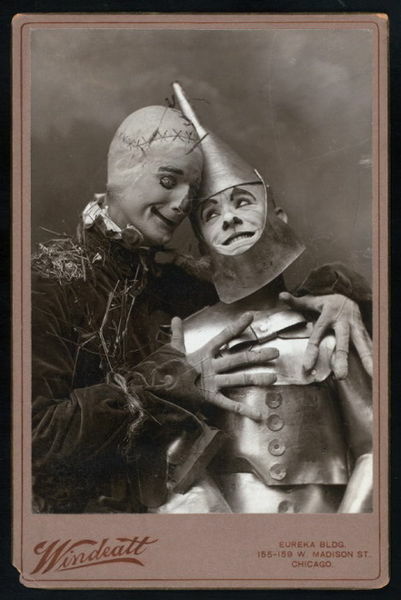 I — I hardly know, sir, just at present — at least I know who I was when I got up this morning, but I think I must have been changed several times since then. .
I’m Nobody! Who are you? Are you – Nobody – too? Then there’s a pair of us! Don’t tell! they’d banish us – you know! How dreary – to be – Somebody! How public – like a Frog – To tell your name – the livelong June – To an admiring Bog! Why might this be reasonable? (Glad you asked.) Turns out that when your parents named you, that name was recorded on your birth certificate. And, because few parents know better, the name became abandoned property after a time, which the state claimed. They now own that name! And if you identify yourself to the court by that name, they own you, too. The name is your strawman, detailed in a slim-but-revealing volume, which carries with it many liabilities. A Rose is a Rose, unless her name is Alice!